Sounds like a mouthful. Bacon wrapped asparagus bundles. 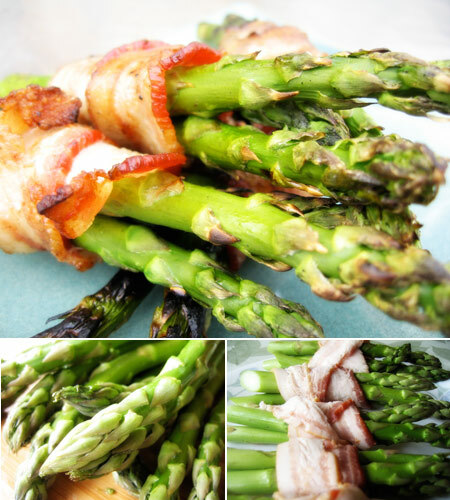 What could be better than delicious asparagus wrapped up in bacon, then grilled to perfection? My recent visit to the store led me to purchase some really great looking asparagus that was on sale. I really love asparagus, but will admit that I do not purchase but only ten times or so a year, and typically that is in the late spring and early summer when I do make the purchase. I was grilling some hamburgers for my kids the other night, and knowing that my kids love bacon, I thought, what a perfect match. They could eat the bacon if they wanted to, but I really wanted them to try the asparagus (failed). Regardless, my wife and I gobbled up these delicious bundles, one by one, and realized that we would be making these again this summer. Begin by cleaning your asparagus, snapping off the bottom pieces, and trimming the bottom ends to look nice. Take three pieces of the asparagus and wrap a slice of bacon around the center, creating a bundle. Repeat this step for the remaining asparagus and bacon. Heat your grill to a medium heat. Add the bundles to the grill, cooking a few minutes per side. Your goal here is to not only cook your bacon, but to also cook your asparagus to the point where they are tender, being careful not to burn your bacon, nor your asparagus. Sounds tricky, but it is not; just keep an eye on it. It is that simple. Goes great with anything. A clever side I’ll use now to sneak the greens onto the grill. Thanks!